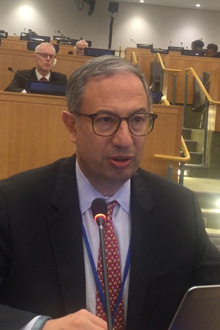 Emory physician, professor and public health expert Carlos del Rio delivered remarks at the “90-90-90 and Human Resources for Health” meeting during the Joint United Nations Programme on HIV/AIDS (UNAIDS) High Level Meeting on HIV/AIDS. "While AIDS is not a death sentence anymore, it is a life sentence," Emory physician, professor and public health expert Carlos del Rio explained during a recent meeting on HIV hosted by the United Nations, calling for strengthening health care systems around the globe to care for those affected by HIV and other illnesses. Del Rio, Hubert Professor and Chair of the Hubert Department of Global Health at Rollins School of Public Health and professor of medicine in Emory School of Medicine, delivered remarks at the “90-90-90 and Human Resources for Health” meeting during the Joint United Nations Programme on HIV/AIDS (UNAIDS) High Level Meeting on HIV/AIDS in New York on Thursday, June 9. Del Rio is co-director of the Emory Center for AIDS Research and chair of the HIV Medicine Association of the Infectious Diseases Society of America. In his remarks, Del Rio stressed the ongoing need to strengthen public health systems to address not only HIV, but other illnesses as well. “In my clinic we are seeing a continuing increase in the patient load. New patients still come in and the ones on therapy will continue under our care for the rest of their lives because, as a patient said to me once, while AIDS is not a death sentence anymore it is a life sentence," he said. He called for more resources and health care workers to prevent and treat diseases "from AIDS to Zika." A recording of the meeting can be viewed on UN Web TV. Del Rio's remarks begin around the 1:34:32 mark.